Laser engraving is a great way to personalize metal shell atomizers. These can be used for promotional activities by fragrance companies or as thank you gifts at weddings, parties or other events. This high quality, useful and unique personalized product will make your customers, friends and colleagues remember your special events for a long time. A laser beam cuts the top surface of the metal engraving the name or pattern that is desired. Can the engraved design be made in different colors? No. The laser cuts the top surface of the metal exposing the base metal. The base metal is aluminum, and therefore the color of the engraved design or text will always be silver. 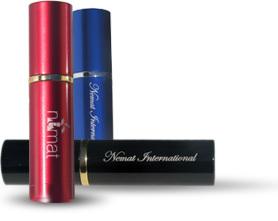 The engraved design or text is clearly seen if the color of the atomizer is dark such as Black, Blue or Red. If the color of the atomizer is Silver or Pink the contrast between the color of the atomizer and the silver engraved design is not much and therefore the engraved design is not clearly seen. Can the design or text be engraved around the atomizer instead of along the length of the atomizer? No. The laser beam moves along the top surface of the atomizer along the length of the atomizer. Therefore the design is engraved along the length of the atomizer only, as shown in the pictures above. Is there a minimum quantity requirement for laser engraving the atomizers? Yes. The minimum quantity is 100 pieces. What is the price for laser engraving 5m and 10ml metal shell atomizers? Full payment for the atomizers and the engraving services is required before the atomizers can be engraved. How long does it take to laser engrave the atomizers? The usual turnaround time is 2 weeks once complete design and payment is received. The time required may be more if there is a back log. The artwork should have a resolution of at least 300dpi. Size of the artwork should be about 2 inches x ½ inch. Artwork files can be submitted as JPG, PDF or CDR. CDR file format is preferred. If interested, please submit the inquiry form below with details including the artwork. Please make sure that the artwork is sharp and clear. Some picture files have shadows or dots (grainy). The shadows or dots will be reproduced in the laser engraved image and may not be desirable.